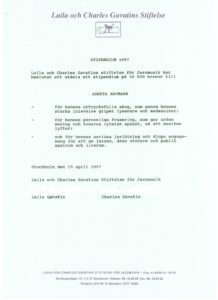 Agneta Baumann tilldelades 1997 ett stipendium från Laila och Charles Gavatins Stiftelse för Jazzmusik "för hennes uttrycksfulla sång, som genom hennes starka inlevelse griper lyssnare och medmusiker; för hennes personliga frasering, som ger orden mening och tonerna rytmisk spänst, så att musiken lyfter; och för hennes seriösa inriktning och hennes djupa engagemang för att ge jazzen, dess utövare och publik spelrum och livsrum. Up until the middle of the 60's Agneta Baumann (1944-2011) had become established not purely as a jazz singer but more as a jazz-influenced artist-entertainer had in the glamorous environment of late-night dinner/dance restaurants. She was born in the town of Kalmar in southeastern Sweden where as a youngster she sang in the school choir and as a teenager in the school jazz band, as she happened to prefer Anita O'Day to Elvis Presley. Later in life she also came to appreciate the artistry of Sarah Vaughan, Carmen McRae and Billie Holiday. But it was not until after some years spent in other working activities that music took a central role in her life. In 1965 she began to sing in Copenhagen with 'The Golden Girls', a popular group in the style of The Supremes, and after an engagement in Stockholm in 1968 she decided to stay and branch out on her own. During the following years she toured throughout the country and abroad with her own constellation "Agneta Baumann's Orchestra". By the end of the 60s she had established a name for herself as a jazz-influenced entertainment artist and bandleader in smart restaurants. From the later part of the 70's she also often sang together with jazz pianist Knud Jørgensen and bass-player Bengt Hanson. Knud taught her what is perhaps the most important thing of all, namely that the space between phrases is also music, and that you have to mean what you sing. In 1986 tragically Agneta's husband died and in her bereavement a dark shadow of silence fell over her singing career. It wasn't until the autumn of 1995 that she broke the long silence and began to build up her own forum once again in Stockholm. She began to go in whole-heartedly for jazz and to give vent to her genuine jazz feeling, more often than not in the company of, among others, pianists Knud Jørgensen and Lasse Bagge. Being deeply committed to jazz, Agneta has done her share to provide opportunities for jazz musicians to meet audiences. In 1995 she established regular late-night sessions under her leadership in restaurant environments, and presented her own "Jazz Corner" every Monday. In 1996 she made her jazz debut on a highly acclaimed record, "A Time For Love" (TMcCD 006) - a collection of ballads accompanied by among others the tenor saxophonist Anders Lindskog. It was no coincidence that she was chosen as the only female Swedish singer to appear at Euro-Jazz 98, a festival which was held at the Stockholm Cultural Center in 1998, the year Stockholm was the Cultural Capital of Europe. 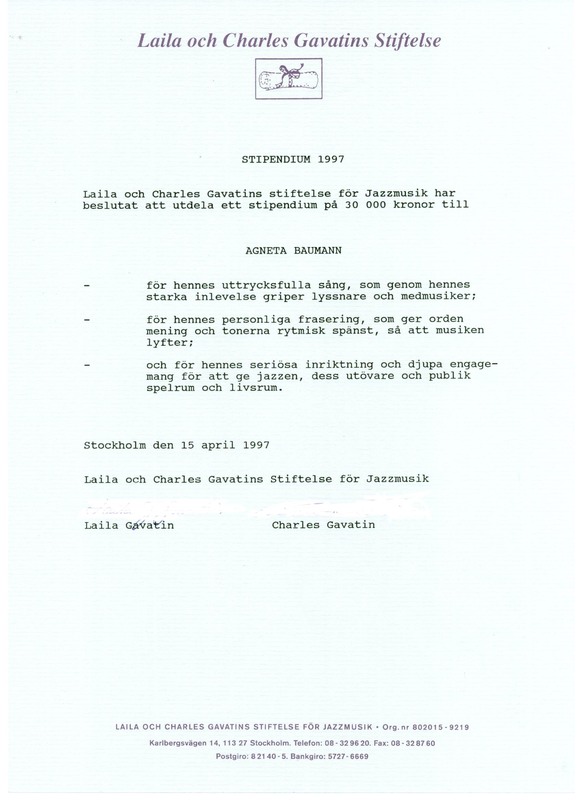 In 1997 Agneta Baumann received a scholarship from Laila and Charles Gavatin's Foundation for Jazz Music. During later years she appeared at jazz festivals for instance in Moscow, Warsaw, Krakow, Copenhagen and Helsinki as well as in Stockholm and at jazz clubs around Sweden with her group. In November1999 Agneta followed up her first CD "A Time For Love" with "Comes Love......" (TMcCD 011) - now accompanied by trumpeter Bosse Broberg, pianist Gösta Rundqvist, double-bass player Hans Backenroth and drummer Johan Löfcrantz.